Want to know how creatine works to build your muscles? You've come to the right place. The steps below explain, chemically, how creatine makes your muscles stronger. First, Where Do You Normally Get Creatine? You normally get creatine from the foods in your diet, mostly red meat and fish. However, most cooking destroys the creatine in meat, so unless you eat massive amounts of sushi and steak tartare you probably aren't getting a ton from your diet. You also make a certain amount of creatine in your body, in your kidney and pancreas.4 But, again, your own body synthesizes pretty small amounts. Which is why creatine supplements help so much! Warning: There Be Science Here! Creatine is made up of the three amino acids: arginine, glycine, and methionine. In your body it joins with a phosphate group to create Phosphocreatine. So, creatine is just something you can hang a phosphate group on, in case you need to use the phosphate group later. And you will need it later! ATP (adenosine triphosphate) is the powerful fuel used in cells for anaerobic energy, i.e. exercise and movement that does not require oxygen. Examples of anaerobic exercises would be weight lifting and the long jump, while examples of aerobic exercises would be jogging and swimming. When ATP is used for energy, one of the three phosphate groups is broken off of it (remember, it was triphosphate) which releases energy for your cell to use. This converts the ATP into ADP (adenosine diphosphate, because there are only two phosphate groups attached now). But remember we were storing extra phosphate groups on the creatine, making phosphocreatine? Phosphocreatine can give up its phosphate group to ADP, turning it back into ATP. And ready to give you more energy by breaking down into ADP again. So, when you saturate your muscles with creatine by eating supplements, which turns into phosphocreatine, you have tons more phosphate groups ready to change ADP back into ATP. Which gives you much more capacity to exert energy for anaerobic exercises, like lifting more weight than you could normally. And that's how creatine works to make you stronger and to help you make faster gains in weight lifting! • Click here to learn more about The Best Muscle Building Supplement Info! 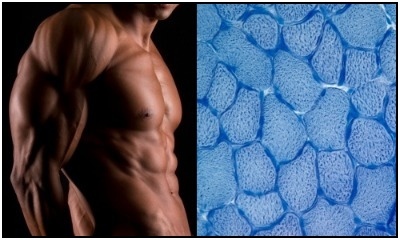 • Click here to leave 'How Creatine Works to Build Your Muscles' & go back to the Home-page! 1. Baechle, Thomas R., and Roger W. Earle. 2008. Essentials of Strength Training and Conditioning. Champaign, Ill: Human Kinetics. Pp. 195. 2. Benardot, Dan, and Dan Benardot. 2006. Advanced Sports Nutrition. Champaign, IL: Human Kinetics. Pp. 107.